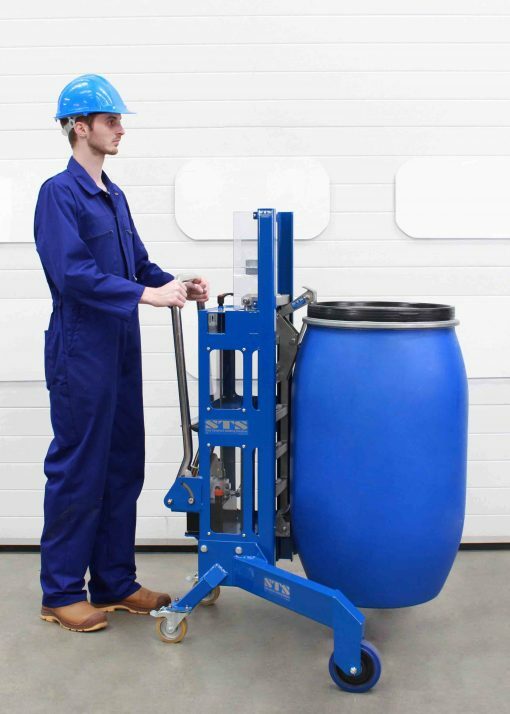 Industrial 205-litre drums and barrels can weigh up to 350kg (772lb) when full, these weights are well in excess of the UK guidance on manual handling – the male and female upper limit is 25kg and 16kg respectively. With drum weights potentially being 22 times greater than guideline manual handling limits, these containers pose a severe health and safety risk to people who handle them. For companies that use barrels and drums within their operation, drum handling safety should be an important part of work culture. 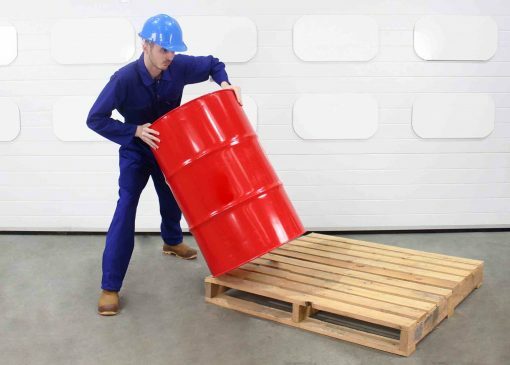 Employers must look at the risks of loading and unloading heavy drums/barrels and put sensible health and safety measures in place to avoid the need for hazardous manual handling. In this post we are going to discuss the current landscape, risks and recommendations surrounding incorrect drum handling and ways to improve drum handling safety during daily operations. 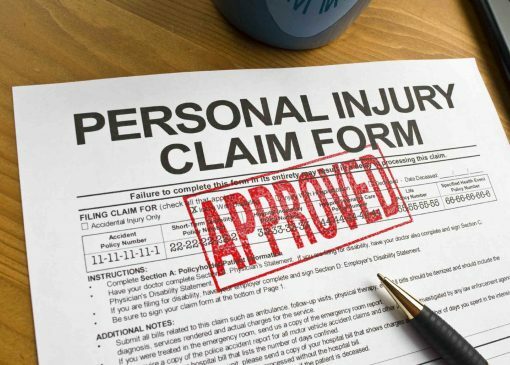 Personal injury claims are to be avoided at all costs. This shows the incorrect way of removing a drum from a pallet. 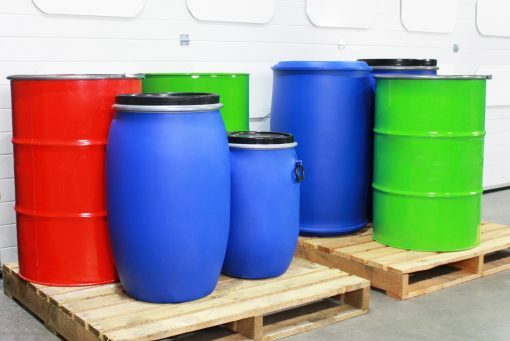 Many companies still ask staff to manually move drums and barrels, exposing them to the risk or injury and/or various musculoskeletal disorders (MSDs). Preventable workplace injuries are occurring daily in an age when drum handling equipment is readily available on the market. Some operators avoid using provided manual handling equipment, only to take legal action when they become incapacitated due to an injury. In certain scenarios poor-quality ‘safety’ equipment is used which is not fit for purpose and as a result injury still occurs. Many companies are unaware of the legislation surrounding manual handling equipment and so place their employees and their business at risk by not ensuring safe drum handling within the workplace. 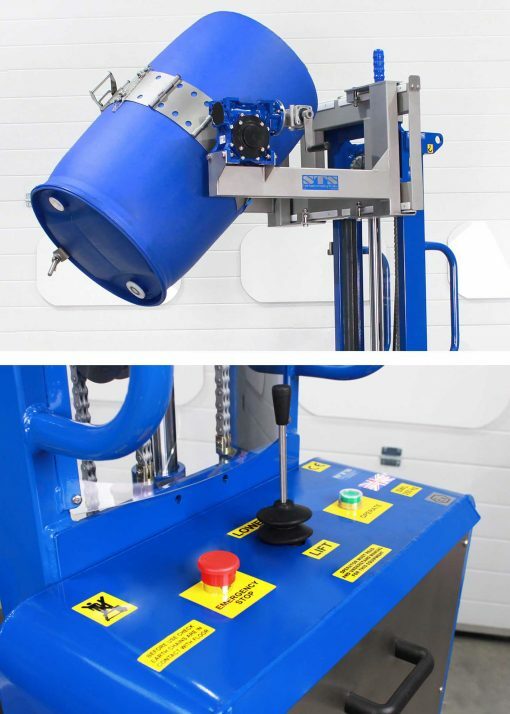 It can be difficult for companies to know whether equipment available on the market complies with the Machinery Directive or allows compliance with manual handling guidelines; just because a piece of equipment is for sale on the internet it does not mean it necessarily complies with any Directives or British Standards, or that an acceptable risk assessment can be written about the use of such equipment. The pushing, pulling and lifting forces operators exert when using drum handling equipment are often found to be in excess of recommended handling limits. In some cases, drum handling products are available on the market for purchase, without the required guarding being supplied. 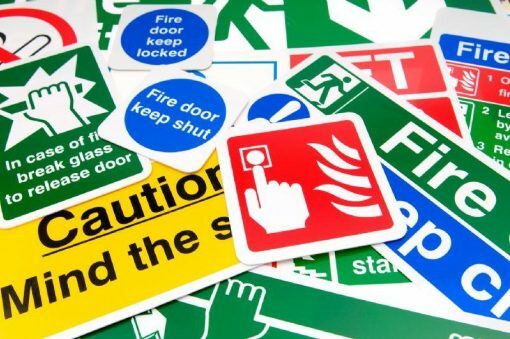 Electrical equipment designed for use in the workplace must conform to the applicable electrical regulations and be assembled by suitably qualified personnel. Drums come in all shapes and sizes. 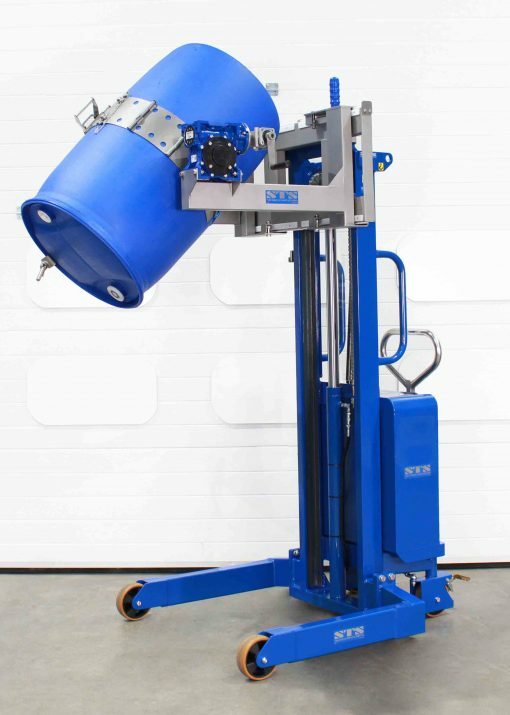 Versatile drum handling equipment is required to handle a wide range of drum types. Decanting drums/loading racking with a forklift by lifting them up in the horizontal orientation, drums can slide off the ends of the forks causing damage or injury. Wide-ranging musculoskeletal disorders as a result of long-term improper handling of heavy loads, often involving the spine/back, shoulder or neck. Any injury means lost time and reduces employee moral. 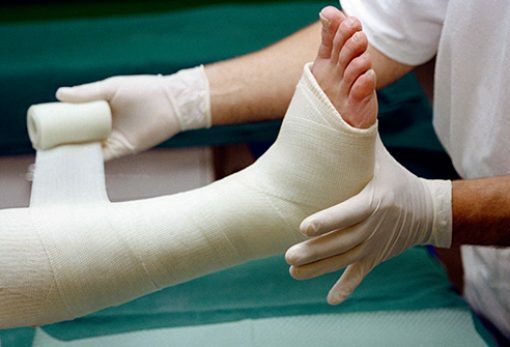 Bad injuries can result in employees being off work for weeks or months. Respirator - if decanting materials which give off noxious vapour or dust. Drum handling should be included in workplace risk assessments. Correct signage forms part of drum handling safety. Before moving, check the drum for damage and ensure the bung/lid is securely fastened. Wear appropriate PPE, drums of hazardous chemicals may be coated in dangerous residues. When moving drums from ‘A’ to ‘B’ ensure the pathway you plan to take is clear and free from debris. Ensure the drum trolley being used is in a good condition and is designed to handle the specific drum type being handled; some drum trolleys cannot handle plastic open-top drums, luckily our unique drum trolley can handle plastic drums with ease. Do not attempt to move drums up and down steep slopes with manual equipment not intended for the application. 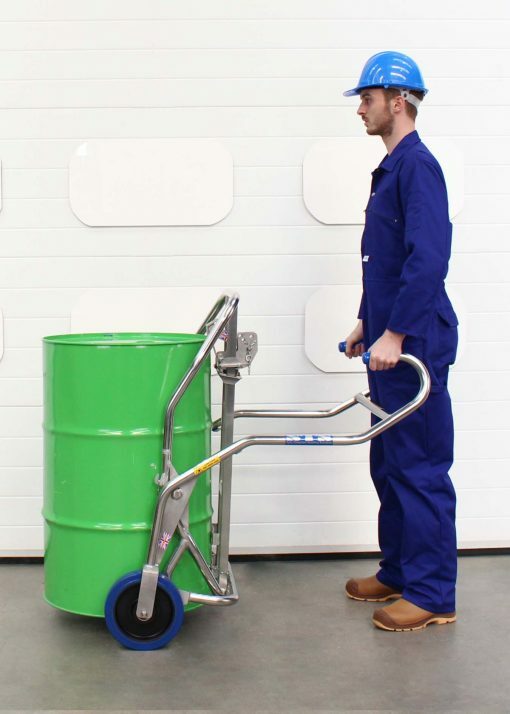 Operate drum hand trucks with a straight back using two hands and your leg if required by the design of the trolley; ensure no one is standing close to the load during manipulation. This Drum Dispensing Cradle offers 350mm of decanting clearance. See our award winning drum trolley designed to protect operators. When lifting drums from (or onto) a pallet always use fully-tested drum lifting equipment suitable for the task, keep hands and other personnel clear of the drum when the lifting action is being carried out. 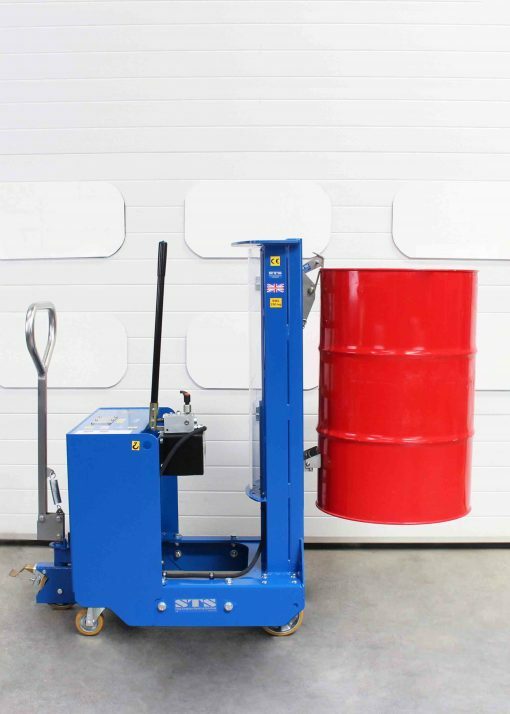 Check the safe working load (SWL) of the drum lifter is suitable for the weight of drums being handled. Ensure the connection between the drum and the lifter is secure, if in doubt lower the drum back down. When transporting a drum using a drum lifter keep the load as close to the ground as practicable in case it becomes detached for any reason. Do not keep drums in a raised position when leaving the machine unattended for any length of time. When lowering drums down onto the ground ensure that no cables or hoses get trapped beneath the drum, equally ensure pallets are in a good condition before loading heavy drums onto them. Lift drums from the corner of a pallet with ease. A popular option for loading bunds, conveyors or machines. 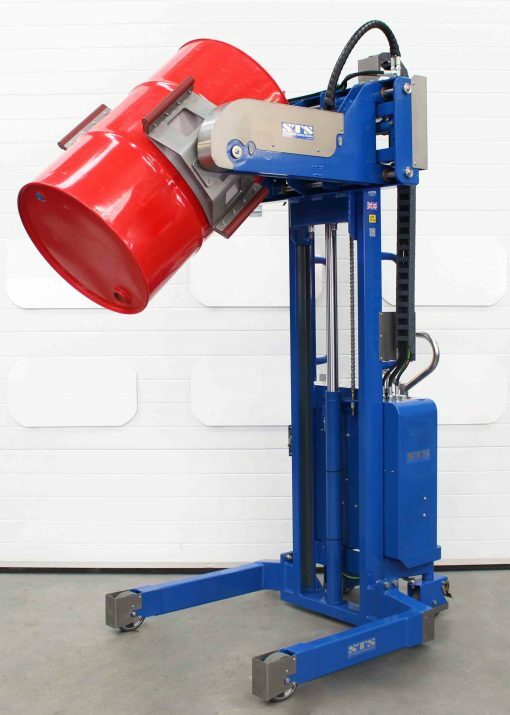 Ensure drums are securely affixed to the drum tipping machine before raising up to height; personnel should not stand in front of the drum rotator during lifting operations. Drum tipping units should only be moved at slow speed when loads are raised to full height, this is due to the reduced stability of the unit in this condition. Ensure you can see where you are tipping the contents of the drum, if required ask a second member of staff to provide guidance from a safe secondary viewing location. 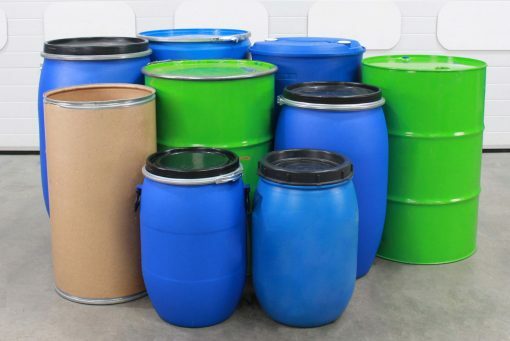 The receiving vessel or container should have a large enough hole to receive the drum contents, consider using a large funnel, drum tap or other device to prevent costly spillages. Only keep drums in the raised position while decanting, once complete gently lower drums back down to the ground. Mobile drum tippers avoid the need for forklift trucks in confined work areas. Power clamp ATEX models are popular in hazardous environments. Safety guarding should be fitted around all drum mixers to comply with the Machinery Directive 2006/42/EC, when the gate/door is opened the drum mixer must stop running immediately. Load all drum mixers with an appropriately specified drum lifter. Before mixing, check the drum for damage and ensure the bung/lid is securely fastened; lid seals should be checked to ensure they are in a good condition. Secure the drum into the mixer using the correct arrangement as specified by the manufacturer. Ensure the settings for speed control and mix duration (if present) are adjusted correctly before mixing is started. Power cables or air supply hoses should be routed to avoid them being a trip hazard. Full machine guarding is a must to safeguard operators. Handling drums in an explosive area poses an additional set of risks and safety concerns. 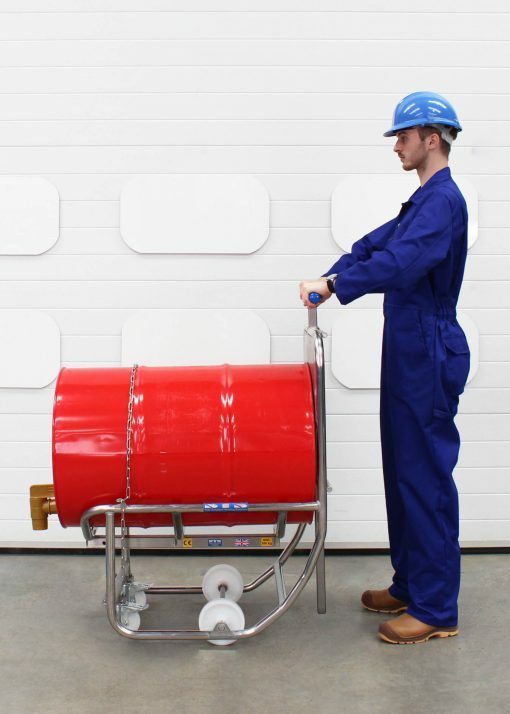 The following points are things to consider when using and/or sourcing ATEX drum handling equipment. Ensure earthing chains are fitted to mobile equipment and are in contact with the ground; depending on the application utilise earthing clamps to ground equipment and avoid a build up of static electricity. Large sections of plastic and other man-made materials should be anti-static or conductive; this eliminates the build-up of static energy which could generate a spark. Mild steel drums will rust over time, as steel rusts the chance of a drum creating a spark when moved increases significantly; use drums which are in a good condition (no rust) and do not allow them to be dropped or driven into with forklifts or other equipment. Stainless steel is much less prone to creating sparks due to the material composition and characteristics (in can still spark under the right conditions). Use stainless steel to protect mild steel corners or edges and reduce the risk of mild steel on mild steel contact (high chance of spark generation). Bolts, nuts and other protruding articles should be made from stainless steel as opposed to mild steel, again to reduce the chance of spark generation. Wheels used in hazardous areas should be anti-static and/or have some method of dissipating any electrical charges which are generated. Many safe working practices which apply to drum handling also apply to other areas of workplace health and safety. As such we have also detailed below some general health and safety recommendations which should be adopted in the workplace. ATEX stacker trucks reduce the need for ATEX-approved forklift trucks. Quality handling equipment lasts decades and has minimal downtime. Ensure the workplace is clean, tidy and well illuminated. Staff should be able to see what they are doing and should not easily trip or fall over objects left lying around. 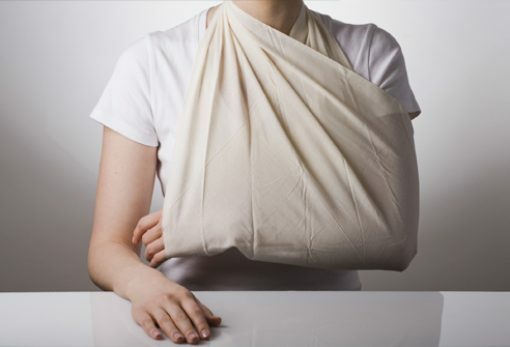 Manual handling training should be provided to all staff at regular intervals. The training should include specific manual handling scenarios which are experienced during normal business operations. 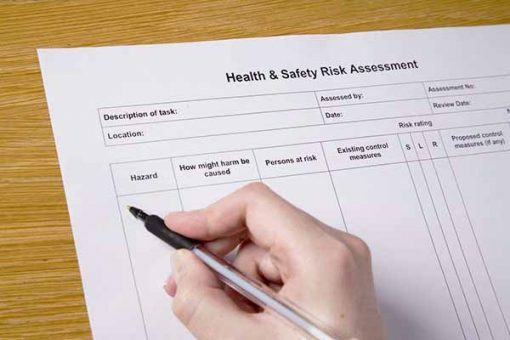 Risk assessments should be completed, and any mitigation actions should be taken, thus reducing the overall risk of injury in the workplace. 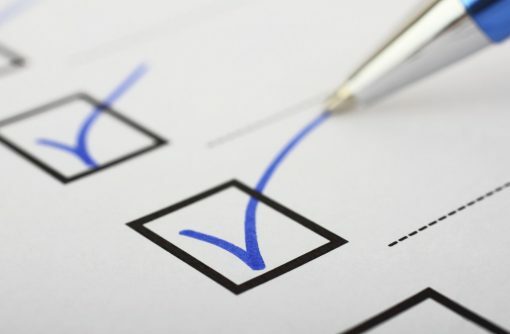 Employees should read all risk assessments and ensure they work in accordance with standard operating procedures (SOPs). Risk assessments must be carried out and should be realistic. 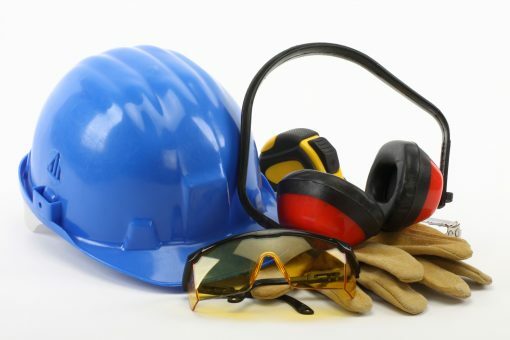 PPE forms an important part of daily workplace safety.